Pawtucket City Hall is located at 137 Roosevelt Avenue, Pawtucket RI 02860; phone: 401-728-0500. 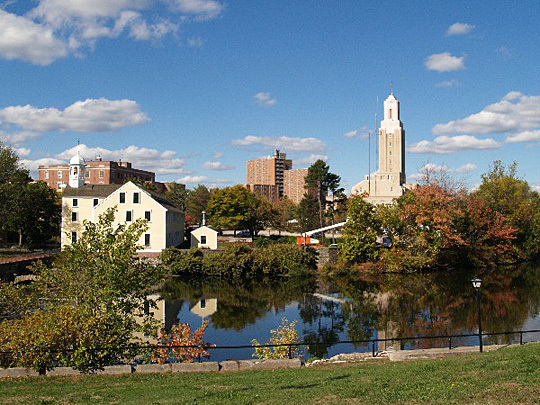 Photo: View of Blackstone River and City of Pawtucket, Marc N. Belanger, photographer, 2008, en.wikipedia.org, accessed January 2011. The City is located in the northeasterly part of Rhode Island at the head of Narragansett Bay on a relatively flat plain that is penetrated by the valleys of the Blackstone and Moshassuck Rivers. The western half of the City has greater variations in elevation. The predominant surficial materials in the Pawtucket area are sand and gravel deposits laid down by receding glacial ice in pre-historic times. The only natural and physical barriers to the use of land in Pawtucket are excessive slopes along the riverbanks and swampy deposits along the Moshassuck River Valley and the Ten Mile River. The original village was founded in 1671 by an ironworker, Joseph Jenks, Jr. The City's renown, however, is traced from 1791 when Samuel Slater opened the first cotton mill in America just above the Pawtucket Falls. From its beginnings as the first textile manufacturing City in the United States, Pawtucket has developed into a mature City whose people still rely on industry for their livelihood, although that reliance has dropped off significantly over the past decade. Development of the City was undoubtedly influenced strongly by its location on the main route from Providence to Boston and points north. Buildings were concentrated along Main Street and around the Main Street Bridge. The Exchange Street Bridge was added in 1872 and the Division Street Bridge in 1876 to accommodate the expanding community. The Division Street Bridge served as a vital link for north-south travel over U.S. Route 1 until the completion of the Route 95 bridge. Vessels and barges carrying coal and lumber arrived in Pawtucket at the head of the Narragansett Bay by the Seekonk and Pawtucket Rivers long before the automobile had become the dynamic force that it is today. Pre 1636 Narragansett, Wampanoag, Niantic, and Pequot Indian tribes inhabit the Rhode Island area. 1636 Roger Williams, a minister who is banished from the Massachusetts Bay Colony for theological disagreements, lands on shore of present day Providence. Later, he negotiates purchase of land extending to the falls at Pawtucket. Soon after, other settlements begin in Portsmouth, Newport, and Warwick. 1644 English Parliament grants a charter, for the Rhode Island Colony. 1671 Joseph Jenks Jr. establishes a forge near the falls of the Blackstone River. He is the first permanent settler in what will be called Pawtucket Village. 1675-76 Period known as King Philip War when Indian tribes rebel and destroy many buildings in Rhode Island and SE Massachusetts. The Jenks industrial settlement is eventually rebuilt. 1685 Daggett House constructed in what is now Slater Park. Building was restored by Daughters of the American Revolution and is now a museum. 1713 A wooden bridge is constructed at the Blackstone River Falls providing an important link in the route from Providence to Boston. Until 1862, the east side of present day Pawtucket is in Rehoboth, Massachusetts, and the west side in North Providence, Rhode Island. 1714 A series of dams and trenches are constructed on the Blackstone River to use waterpower for growing industries (Gristmill and Sawmill). Outlying areas are used for farming. The Jenks family businesses produce iron objects, implements, and ships anchors. 1772-76 Revolutionary War Period. Pawtucket Village industries produce cannons, muskets, ramrods, and bayonets. Newport is occupied by the British for thee years, and shipping is prohibited in Narragansett Bay. Providence merchants sell goods to the Revolutionary forces at considerable profit. 1790 Providence merchants have capital available and are seeking to profitably spin cotton yarn. English mill owners withhold information on their successful Arkwright Spinning Process. Samuel Slater, and an English immigrant who was working in a supervisory capacity with The Arkwright System, is hired by Providence merchant Moses Brown to revamp his machinery to duplicate the English process. On November 20, 1790, Slater's shop began to spin yarn full time, and the manufacturing of cotton yarn would soon become a factory based rather than a cottage based industry. Almy and Brown built a mill to Slater's specifications which opened in 1793. The mill has been reconstructed by the Old Slater Mill Association to its conjectured appearance of about 1835. 1808-15 A period of expansion for Cotton Mills in Rhode Island. Mills were generally small and distributed throughout the State. Center of production shifts to present-day towns of Coventry, West Warwick and Warwick using the Pawtuxet River. The Wilkinson Mill, at the Slater Mill Historic Site, is constructed as a combination spinning mill and machine shop. 1813 Around this date, Boston Financiers begin constructing canals and large mills at northern sites such as Lowell, Massachusetts, Manchester, New Hampshire and Saco, Maine. 1829 Financial panic results in receivership of many local industries. Samuel Slater's business interests expand to other Rhode Island cities. At this time, Lowell, Massachusetts is being constructed as a major cotton production site. Approx. 1835 For comparative purposes, around this period in Lowell, Massachusetts had eight major mills employing 7,500 workers; Rhode Island had 116 mills with 8,000 workers. The new mills in Lowell are enormous structures where the entire manufacturing process, from cleaning raw cotton to finished cloth is carried out in one complex. Later 1830's Steam engine power is first used by Samuel Slater in a large cotton mill in Providence. The location for new cotton mills shift to the coastal areas because it is easier to ship coal and the humidity is ideal for cotton spinning. The steam engine brings reliability and greater productivity to all industrial applications. 1840's Construction of the Providence and Worcester and Boston and Providence Railroad helps to stimulate the local economy. Of the new industrial plants erected during this period, the majority were located outside the established manufacturing district at the Falls. 1860's Industrial building shifts to outlying sites. Examples — Conant Thread (Coats&Clark). 1874 Pawtucket incorporates as a Town using present day boundaries. 1886 Pawtucket incorporates as a City. 1902 The Deborah Cooke Sayles Public Library is given to the City by its first Mayor, Frederick Sayles. After the turn of the century, northern cotton manufacturers face stiff competition from Southern mills. 1924 Slater Mill is purchased by the Old Slater Mill Association for preservation as a historic landmark. City of Pawtucket, City of Pawtucket Comprehensive Plan, 2003, Pawtucket RI, www.pawtucketri.com.